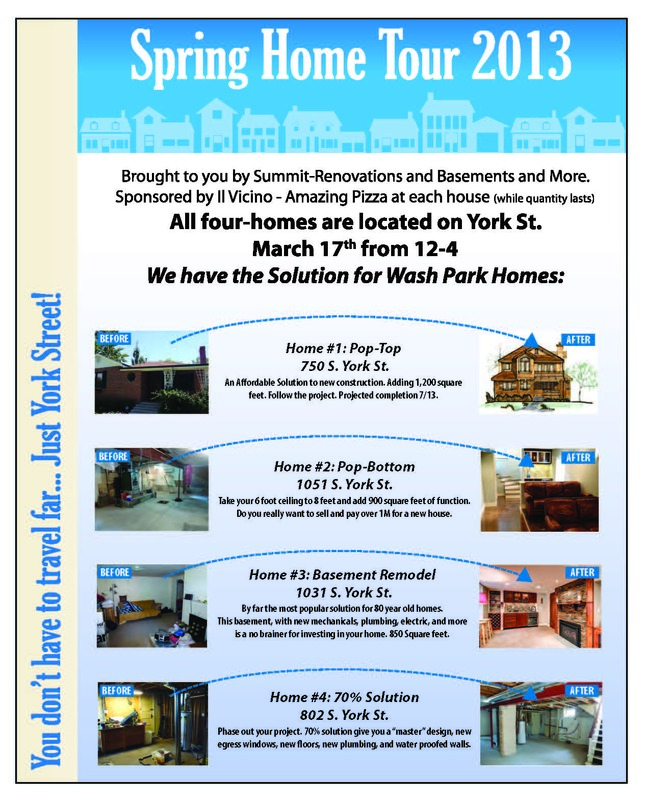 We will be touring four Wash Park homes on York St. on March 17th from 12-4pm! Il Vicino will be providing pizza at each location for you to enjoy while quantities last. Have some lunch and learn about how you can gain more space affordably in your home without moving away from the neighborhood you love! Call (303) 862-0165 or (303) 944-0488 for more information. Home 1: A Pop-Top at 750 S. York. Pop-Tops are an affordable solution to add 1200 sq ft to a home! Project completion expected in July. Home 2: A Pop-Bottom at 1051 S. York. We added 900 sq ft of function by increasing the ceilings to 8 feet and renovating this homeowner’s basement saving them a bunch of money! Home 3: A Complete Basement Remodel at 1031 S. York. We added new mechanicals, plumbing, electric and more to this basement to give these homeowners an extra 850 sq ft of usable space! Home 4: A 70% Solution at 802 S. York st. Phase out your project by adding in features like egress windows, new floors, plumbing, electric and water proofed walls. Save the finishing for later or do it yourself and just leave the dirty work to us!